Sooty blotch and flyspeck are surface blemish diseases caused by fungi that commonly appear together on apple or pear in late summer and fall. Although these diseases may shorten the storage life of fruit due to increased water loss, they do not cause decay, and losses are attributed to unacceptable appearance. During wet growing seasons, losses of 25% or higher commonly occur, even in orchards treated with fungicides. Many fungi are involved in this complex of pathogens, including Peltaster fructicola, Geastrumia polystigmatus, Leptodontium elatus, and Zygophiala jamaicensis. Sooty blotch appears as sooty smudges or olive-green spots on mature fruit (fig. 1). Individual spots or smudges vary from discrete circular colonies to large lesions with diffused margins. Different colony appearances are attributable to different fungal pathogens that comprise the disease complex. Flyspeck is characterized by clusters of 10 to 50 sharply defined, black, shiny specks on the fruit surface (fig. 2). These superficial colonies are round to irregular and usually measure 1/16 inch to 1 inch in diameter. The individual dots or specks are fruiting structures. Spores form in these fruiting structures and cause secondary spread. 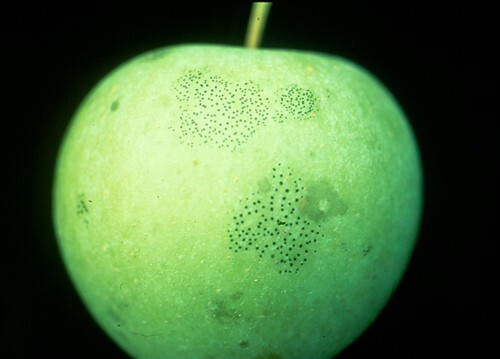 Although these diseases may appear separately, they commonly appear together on the same fruit. Typically, fruit symptoms are visible by the first part of July and become more easily seen as the season progresses. 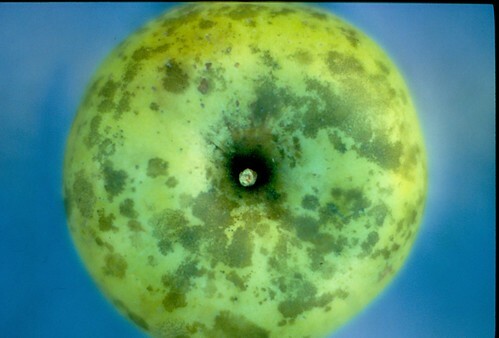 Although no significant differences exist among apple cultivars in susceptibility to these diseases, symptoms are more apparent on yellow, green, or light-colored fruit. Fruits of apple and pear having the thickest cuticle appear to be more severely affected. Figure 1. Sooty blotch on 'Golden Delicious' fruit. Photo: Kenneth D. Hickey, Penn State University. Figure 2. Flyspeck on 'Golden Delicious' fruit. Photo: Kenneth D. Hickey, Penn State University. Commonly, the fungi that cause sooty blotch and flyspeck are found on the stem surfaces of many woody plants, including apple shoots. Infections may occur on fruit as early as 2 to 3 weeks after petal fall and are intensified by frequent rain periods and poor drying conditions. Mycelial growth that forms the sooty blotches can occur in the absence of free water at relative humidity greater than 90%. Symptoms of both diseases develop relatively slowly, typically over 20 to 25 days in the orchard, but possibly over 8 to 12 days under optimum conditions. Optimum conditions for conidial production for the flyspeck pathogen are temperatures of 60°F to 70°F and relative humidity greater than 96%. Manage the disease by practicing proper orchard sanitation and using fungicides. Remove reservoir hosts, especially brambles, from the orchard and surrounding hedgerows to help reduce the amount of inoculum from external sources. Keep in mind, however, that during wet years, this practice alone may not be adequate for disease control. Some cultural practices may help prevent or reduce the severity of the diseases. These include dormant and summer pruning to open up the tree canopy and thinning to separate fruit clusters. In addition to facilitating the drying of fruit after rain or dew, these practices favor better spray coverage and improve fruit quality. Both diseases are difficult to control in orchards with restricted air movement. Original text prepared by K. D. Hickey, K. S. Yoder, and A. R. Biggs. The original version of this article appeared in The Mid-Atlantic Orchard Monitoring Guide (NRAES-75) and is reproduced with permission from the Natural Resource, Agriculture, and Engineering Service, Cooperative Extension, 152 Riley-Robb Hall, Ithaca, New York 14853-5701, U.S.A. (607) 255-7654. It has been edited for presentation here by Alan R. Biggs, West Virginia University.